Added by gregprice (Greg Price) over 6 years ago. Updated about 6 years ago. correct. 42 lines, most of them comments. $LOAD_PATH or $LOADED_FEATURES has been modified. 17 lines. (3) Patch 3 adds the $LOADED_FEATURES index. 150 lines. (4) Patch 4 adds the $LOAD_PATH cache. 34 lines. Expose whether two arrays are shared (read-only, C only). so that require isn't so slow. loaded-features index a single feature. loaded-features index all the required entries for feature. vm.c (rb_vm_mark): mark new fields. hash.c (rb_hash_clear): make function non-static. itself rather than its individual entries. file.c (rb_get_path_check_convert): extract from rb_get_path_check(). file.c (rb_get_path_check): follow the above change. Instead we call it in load.c. internal.h (rb_get_expanded_load_path): add a declaration. load.c (rb_construct_expanded_load_path): fix for compatibility. $LOAD_PATH and ensure that String object of $LOAD_PATH are frozen. have relative paths or non String objects. if it's changed when getting load path. load.c (rb_get_expanded_load_path): fix for rebuilding cache properly. accessible from other source files. rb_file_expand_path_fast() not to call it. vm.c (rb_vm_mark): mark vm->load_path_check_cache for GC. to check load path cache validity. compatibility related to cached expanded load path. I've also made these patches available at https://github.com/gnprice/ruby , in the "fast-require" branch against a recent trunk and in "fast-require-1.9.3p194" against the latest release. and run "rbenv install /path/to/fast-require". Then "rbenv shell fast-require" will select the new version in the current shell, and "rbenv global fast-require" will select it globally. I believe a great deal of additional speed could be gained by optimizing #require_relative (and making use of it, of course). From what I understand, #require_relative ends up calling ordinary #require code, which is inefficient since #require_relative already knows which path to find the script, so why have require search the $LOAD_PATH for it? In all these efforts to speed up load time it would be nice to see someone tackle this issue as well. #require_relative (and making use of it, of course). I'd like to keep this thread focused on speeding up existing code which uses #require. If you're interested in making changes to #require_relative (which is a function that is not involved in the startup time of most existing libraries or applications), a separate issue would be the best place to discuss that. Issue #7158 has been updated by gregprice (Greg Price). up instead of just speeding up require. I heard that taru-san's analysis of for your patch (1) to (4). (1) to (3) are good (no compatibility issue). "freezing" strings are acceptable (no impact, I think). I want to introduce them. However, (4) has compatibility issue because the patch assume that the current working directory does not changed. Please correct me if our understanding is wrong. Checking for "shares same array" is a great catch :) I like it. But my patch #5767 for $LOAD_PATH so "invasive" cause there is markable benefits from overriding "$:.push", so that whole $LOAD_PATH will not be re-scaped after each $: << gem_path . Also, which way do you handle changing of current directory? Cache should be invalidated on Dir.chdir . Also, which way do you handle changing filesystem encoding? One test from 'make check' fails, if you do not invalidate cache on changing filesystem encoding. load_features_index will be recalculated after each require for new feature also? It is very strange, that you patch for $LOADED_FEATURES gains so much speedup. My patch #5427 gains only 6%, not 40%, and I doubt that hash lookup on ~2000 elements so much faster than crafted binary search (As well as you, I compare only "basename" of a feature). And I have no additional objects: no hashes, no arrays, no substrings, only $LOADED_FEATURES itself sorted in a rignt way. ... but maybe I'm mistacken. 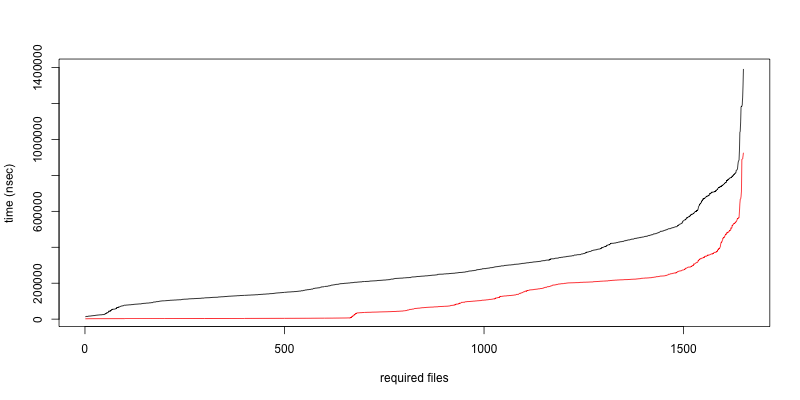 About numbers: speedup 1.40x - is 29% speedup, and 2.20x is 55% speedup. My patches combined gains same 55% speedup as yours. Can you test with "cache" patch but without "index" patch also? Indeed in Greg's patch (4) load path cache remains when current working directory was changed. But so far I cannot find any test cases which fail with Greg's patch. In rb_find_file_safe() in file.c load path is expanded without cache, so cached load path in rb_feature_p() might be recovered by rb_find_file_safe(). I tried to create patches for current working directory change using same approach as Yura Sokolov's #5767. These patches are applied on the Greg's patches. Patch 2 caches expanded relative load path and invalidate cache if current working directory is changed. Patch 3 uses cached expanded load path in rb_find_file_ext_safe() and rb_find_file_safe(). From my benchmark, performance is almost same as Greg's. Benchmark is in the gist. make test, test-all, test-rubyspec seem fine. say (G1) to (G4) and (S1) to (S3) respectively. Could you give us the explanation of compatibility impact? I doubt that current test cases have enough tests. with (S1) to (S3). What's the purpose? I think (S1) is more compatible trunk. It expands only relative load path always. Trunk expands all load path always. If load path has many relative load path, (G1) to (G4) + (S1) performance is more close to (G1) to (G3) since relative paths are no cache. I didn't show benchmark result of that. (S2) is similar approach as Yura's #5767. It caches also relative load path. If current working directory was changed, it invalidates load path cache when getting expanded load path. I can't find test cases which fail so far. Yura's patch is widely used (I'm also using it with 1.9.3) without issues. I think it's enough compatible. I thought (S3) would give performance improvement in theory since it reduces expand costs to use expanded path. But my benchmark shows very small improvement. Yura's #5767 also uses this. Another benchmark might show more meaningful improvement result. If (S2) is enough compatible, (S3) would be also enough compatible because using same expanded load path cache. I'm very happy if you describe the "changed behavior/assumption". Your explanation is "how to do it". But we need to know "what changed". Sorry if I misunderstood your explanation. Or no behavior changed except "freeze $LOAD_PATH" by (G3)? if I didn't overlook anything. Maybe Tarui-san will review them. Sasada-san, thank you for the review. You're right, patch (4) should (and doesn't) invalidate the cache when the working directory changes. I believe Yura is right that it should also invalidate the cache when the filesystem encoding changes. Yura, thanks for your existing patches and your detailed comments. At first look, I suspect that the reason a sorted-list approach to $LOADED_FEATURES was not a major speedup is that insertion is slow -- it takes time O(n), on the same order as the lookup takes in trunk. So it should still be helpful when one does many 'require' calls on the same files, but not as much as if insertion is also fast. With the hash-table-based index in (3), insertion takes time O(p), where p ~= 10 is the number of path components in the library filenames, and lookup is O(1) except in pathological cases. I'm not too worried about recomputing the $LOAD_PATH cache from scratch after it's modified. For one thing, we do so only in an actual 'require' call, and it's only as expensive as the computation we do now in trunk on every 'require' call, so there's no case in which it should cause a regression. I suspect it's also the case that in common usage (with e.g. Bundler) most $LOAD_PATH modifications happen all at once with no intervening 'require' calls, and in that case we will only recompute it once for all of those changes. (But I haven't checked that that's the case.) 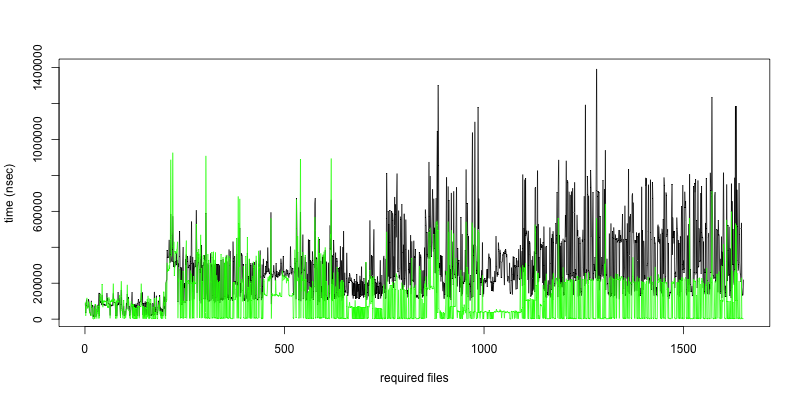 So I think the trade-off of recomputing from scratch with less code complexity is a good one. Shirosaki-san, thanks for your additional patches. I'm reading them now. be leave cheap on this amounts) cost of insertion is O(log n). regression. I suspect it's also the case that in common usage (with e.g. complexity is a good one. I re-checked behavior, and found some compatibility issues. rb_file_expand_path_fast depends on not only current working directory but also home directories too. it uses ENV["HOME"] and getpwnam (normally). if non String Object is included in LOAD_PATH, it will be replaced to result of it's to_str. 1) support both ENV and getpwnam. 3) no support home dirs change. 4) accept (G1)~(G3) and reject others. My intention is 1) since I would like see (G4) merged. No cache for '~' or '~xxxx' and not replace load path. If $LOAD_PATH contains relative path or '~' or '~user', require would slow down. I tried another benchmark. It uses many relative load path instead of expanded load path. In this benchmark, (G1) to (G4) slows down a lot. But I think usually load path contains absolute path. Thank you for fast patch. one point, freezed NonStringObject can return different result by redefining to_str method in class scope. if expand it everytime as same as home dirs, It is not necessary to freeze it. And rb_ary_shared_with_p mechanism will continue operating well about StringObject. Would you make the above-mentioned change? In either case, please commit all patches. I will change to expand NonStringObject(TYPE(v) != T_STRING) every time and not freeze it. I noticed one compatibility issue. rb_file_expand_path_fast calls to_path method before to_str, but to_path was ignored. I fixed to_path is called before to_str. If StringObject has to_path, the object are expended every time because frozen StringObject's to_path can return different result. NonStringObject is not frozen and is expended every times. I extracted functions from rb_get_path_check() and call it in load.c for to_path and to_str. tarui-san, what do you think? I rebased against latest trunk and pushed to github. Just wanted to update with some test results. I tried Hiroshi's patch along with my DTrace patches to time require searches against a small Rails application. Without GC running, before Hiroshi's patch, require searching took about 30% of the app require time. After applying the patch, I saw it was only 16%. "notrace.rb" just contains "GC.disable". This test loads bundler and the rails environment, then exits. Thank you for the careful work. ex) OK even if String#to_path is defined after constructing expand_path? shirosaki-san, sasada-san, endoh-san, what do you think? I don't have any idea on it. In message "Re: [ruby-core:48738] Re: [ruby-trunk - Bug #7158] require is slow in its bookkeeping; can make Rails startup 2.2x faster"
|> shirosaki-san, sasada-san, endoh-san, what do you think? |I don't have any idea on it. Then, go ahead and see if we will face any problem. I agree with that. to_path of T_STRING may be less-useful. Then I'm going to stop calling to_path of T_STRING in rb_get_path_check() for consistency. test, test-all, rubyspec results look fine. So I'll commit if there are no other opinions. This issue was solved with changeset r37477. Greg, thank you for reporting this issue. I am trying Ruby 2.0 RC1 which should contain this fix, but I think I still see many stat and open syscalls with ENOENT result. The number is slightly lower. Here is the full strace output with all these ENOENT lines for 2.0 RC1. I guess something is wrong with locale trying to find all rb/so files with my cs_CZ and cs locales first, which essentialy triple amount of requires. I can confirm the same behavior for 1.9.3 ruby.